This is Palau Digital, the new platform that makes the news, concerts and music content from the Palau de la Música Catalana available to everyone. Today, the Fundació Orfeó Català-Palau de la Música Catalana, in collaboration with Endesa, presented Palau Digital, a new mini site that’s a virtual extension of the cultural and artistic offering from the Palau, which is making its news, concerts and music content available to everyone. This platform is part of the institution’s commitment to digitisation as a tool for disseminating content, building loyalty among the public and promoting interaction. This new space features sound and audio-visual recordings of some of the productions from the programming at the Palau and the Orfeó Català choirs. The Concerts section highlights some of the most important recordings that have taken place at the Palau in recent years, as well as those from the current season or others related to current programming. Some of these concerts will be exclusive and will only be online for a limited time. This section benefits from the support and collaboration of the Corporació Catalana de Mitjans Audiovisuals (Catalan Audiovisual Corporation), which does the majority of the concert recordings at the Palau de la Música Catalana via radio and TV. The Conferences section is where you’ll the sound files for events parallel to the main programming, such as informative talks, masterclasses or meet-ups with artists. This way, there is also space on this digital platform for all the activities supplementary to the programming, making them accessible to people who haven’t been able to attend the events or those who want to relive or complement the experience of coming to the Palau. It should be noted that the content of these two sections will be selected on the basis of relevance and exclusivity, prioritising recordings of more recent concerts and events. In that regard, to complement the range of available recordings, there is also an Archive section on the site, developed by the Documentation Centre of the Orfeó Català (CEDOC), which contains the entire categorised collection of Palau concert recordings, starting from the early years of the institution. 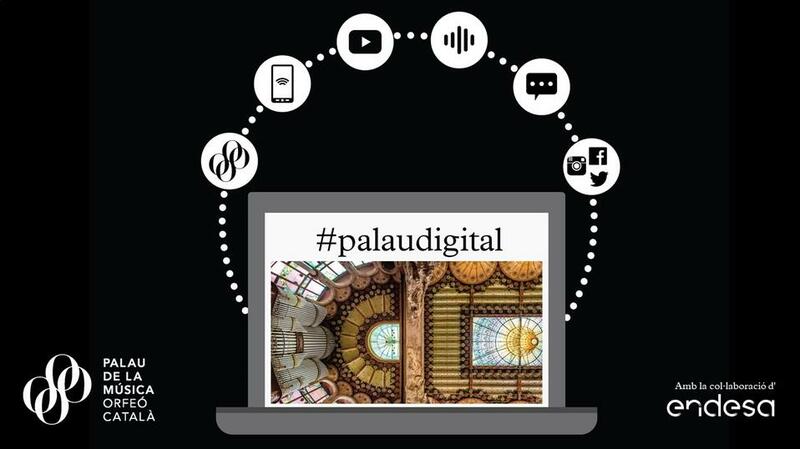 The aim of Palau Digital isn’t just to be a virtual space for enjoying the content that takes place at this iconic Catalan Art Nouveau venue, but to go even further, creating content that has been specially designed and devised to be used digitally. This novel project, still under construction, called Palau Series, will generate informative content produced by the Palau itself, related to music, choir singing and our heritage. It’s a space open to all, where the common thread is understanding and enjoying music. For this project, the Palau de la Música Catalana will seek partners such as sponsor, TV and production companies, to create high-quality audio-visual content for all audiences. The new online platform also includes a News section with the artistic and institutional information generated daily by the Palau and the Orfeó Català. It will thus be a new space for finding out all the latest information and the highlights from the institution. The Blog will include interviews, cultural outreach articles, accounts of Orfeó Català choir trips, as well as interviews about the Clavé XXI project, for example, among other features. While this section is informative, it is also more personalised, seeking to give a voice to the different players who participate in and build each of the Palau’s projects, often with less visibility and impact than the main lines of programming. Finally, Palau Digital includes a section where you can simultaneously view the Social Networks of the Palau, the CEDOC and the choirs, which in total have more than 80,000 followers. Palau Digital is thus another step in the institution’s digitisation, a pilot project that represents a new way to disseminate and offer music content to all audiences: on the one hand, to the music lovers and community most closely involved with the Palau and the Orfeó Català and, on the other, to other audiences interested in culture, music, dissemination and, ultimately, to the population at large. This new web portal can be adapted to mobile devices and joins other projects and technological innovations that have been launched by the Palau de la Música Catalana in recent years, such as the new ticketing system and CRM that came out in 2015; the digitisation and public access to a large part of the CEDOC archive; the implementation of all the digital signage linked to the Palau’s web content in 2016; and other actions carried out related to communication with the Palau’s audiences: digital tickets, access to concert programmes days in advance, segmented offers, etc. In addition to Palau Digital, soon the Palau will be initiating new digital marketing and dissemination strategies to reach new audiences, segment them and build loyalty, by establishing new modes of communication, including the chatbot or virtual assistant, which work using artificial intelligence systems. Endesa has been collaborating with the Palau de la Música Catalana as sponsor for years. This year’s project has a uniqueness that makes it special, because it is dedicated to designing and launching Palau Digital. As a power company, Endesa is also involved in the process of digitising, with the conviction that this is the path of the future. Along these lines, the company is working on both work and operating processes and systems, as well as to be able to give consumers an active role that allows them to choose and personalise how, when and where they wish to use the different services available to them.